Blockchain technology is poised to fundamentally change our online world. This is not some kind of miraculous, cure-all, money-making solution. One specific use of blockchain such as Bitcoin, but rather the fundamental shift for the offline world ushered in by the web with easy to use access to information and the ability to make digital copies of data or content in an unprecedented ease for distribution across the globe. Hence the name, the World Wide Web. That interconnectivity has suffered fundamental problems when it comes to transactions - TRUST. is hard for any trusted or untrusted source to change or modify. This presents a completely new level of security, privacy, and TRUST to our online world. As you will see throughout this book, a variety of uses, protocols, and standards make up the current blockchain ecosystem. We also strive to strike the perfect balance between being a technical reference and a how-to handbook that shows practical examples of both current and future state use cases. While not comprehensive, we do select for several high promise areas where blockchain technology is beginning to enable applications for an entirely new industry segment. 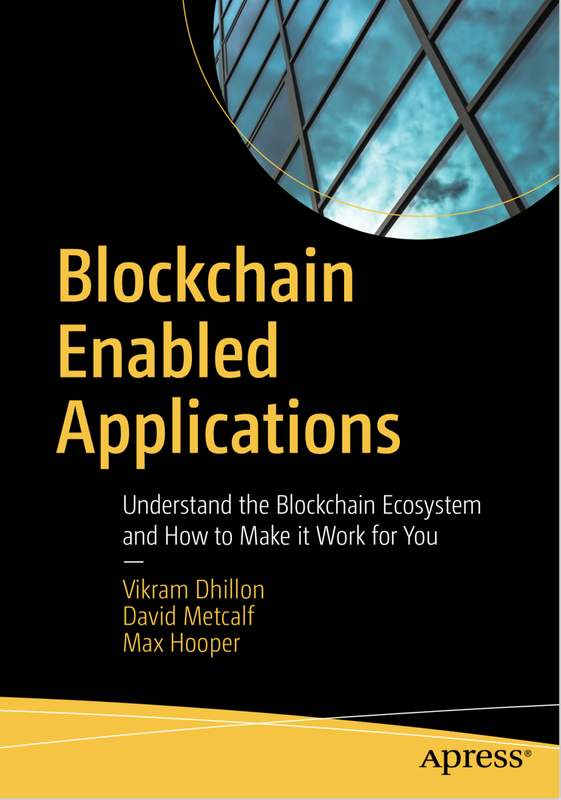 We hope this book will inform you and provides a roadmap to your success leveraging blockchain technology to enable new applications for your business. Throughout the book, you will see many examples of applications to reinforce key points. Early examples extend beyond financial transactions to cover other aspects of FinTech, RegTech (regulation), InsuranceTech, GovTech (eVoting, licensing, records and certification), HealthTech, and many others. In order to understand these early examples, it is necessary to explore the Blockchain history; fundamentals of distributed trust; consensus; hardware, software and encryption in the early chapters. Next, you’ll learn about the network transactions and simplified payments in Blockchain fundamentals. We’ll compare this with the extended capabilities if Ethereum and specific characteristics like how gas works and distributed apps along with examples of Blockchain as a Service. To further extend these capabilities, two chapters are devoted to DAO/Decentralized Organizations and the details and examples in these areas. In Chapter 7, Ethereum Tokens are highlighted for value creation with various technology and business sector examples that highlight the power of Smart Contracts to allow multiple sources of value and rules to be embedded in the transactions directly. The next three chapters- 8, 9 and 10 segment examples into Blockchain in Science, Blockchain in Healthcare, and details on the structure of the Hyperledger Project, respectively. The final two chapters, 11 and 12 explore many recent developments and future trends, particularly in ICOs and the effect on financial markets and processes. as you explore The fundamentals, current best practices and future potential of Blockchain Enabled Applications. We welcome your feedback at info@metil.org.